Rainer Maria Rilke Richard Hugo. Robert Bly. Sara Teasdale. Snorri's Edda. Stephen Dunn. Ted Kooser. W.S. Merwin. Best American Poetry: 2003 (guest editor Yusef Komunyakaa) with "When the Towers Fell", republished in his Strong is Your Hold. Best American Poetry: 2001 (guest editor Robert Hass) with "The Quick and the Dead", republished in his Strong is Your Hold. Best American Poetry: 1999 (guest editor Robert Bly) with "Why Regret", republished as the closing poem in his Strong is Your Hold. Best American Poetry: 1990 (guest editor Jorie Graham) with "When One Has Lived A Long Time Alone", republished as the title poem in his When One Has Lived A Long Time Alone . A New Selected Poems. Imperfect Thirst. Strong Is Your Hold. Prose: Walking Down the Stairs, selections from interviews. Galway Kinnell's 12th collection of poems. 81 pages, but 16 of those are blank or have only a section number, giving 65 printed pages. A proem then five sections each with five poems, giving a total of 26 poems. So 2.5 pages per poem. A set of five "ghazals. ": they lack the rhyme scheme of the classical ghazal. Perhaps Kinnell calls them ghazals because he includes his own name in the stanza, and because his stanzas have jumpy collage-like relationships. A mixed bag about people and their bodies — his aging father, some lovers — plus a report on his visit to the Scottish Isle of Skye. Another mixed bag including poems to poets and sometimes bulging with quotations by others. Galway Kinnell's 14th collection of poems. touch. sound. taste. color. smell. In 90% of the first 10 poems. In 60%. In 60%. In 50%. In 40%. This is about twice as many words of the senses per poems than Aleda Shirley in Dark Familiar and five times as many as in Louise Glück's Averno. Poems grouped into 5 sections. 25 poems in 55 pages of text, so 2.2 pages per poem. Addresses 'you' in 1 (10%) of first 10 poems. with one outlier at 20 stanzas and another at 34 stanzas. with outliers at 33 lines, 35 lines, and 36 lines. 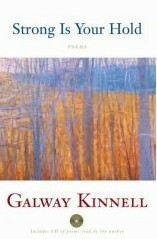 Galway Kinnell's 10th collection of poems. Selections from 11 interviews with Kinnell, made by various interviewers 1969-1976 and subsequently improved by Kinnell with "l'espirit de l'escalier: the remarks you think of as you walk down the stairs at the end of a dinner party ... that would have made you the Toast of Paris if only you'd thought of them a bit sooner." Questions of "gossip, albeit of a high order." He includes here "personal testimony. Have I always wanted to be a poet? How did I begin writing? How do I start a poem? Do I revise? [He is a great reviser.] What do I do about dry spells? Do I find translating useful? Which poets do I read? [Whitman, Smart, Rilke, Neruda, Yeats, and many others.]" Questions of "exegesis of certain poems. It is a modern assumption that there is a key to every poem and the author has it. The trouble is that I don't believe this. ... the author may be the last one to know what his work is about." Questions of "poetry in its technical aspects ... I have always firmly believed that in poetry there is no such thing as technique apart from the poems that use it ... [yet] how cheerfully I held forth about these very matters." "Then there are the big questions: How do you teach poetry? Why do you give poetry readings? Is there any point to political poetry? What is the use of poetry in a technological civilization? What is the relation of modern poetry to tribal poetry? These seem to reflect a curiosity about ... what poetry is and what its purposes are." Born in Providence, Rhode Island, USA. Will become influenced by Walt Whitman, Edgar Allan Poe, and Emily Dickinson. Traveled in Europe and the Middle East. To Paris on a Fulbright Fellowship. Translations: Bitter Victory (novel by René Hardy). 1st book of poems: What a Kingdom It Was. Returned to the USA and became active in the Civil Rights Movement. Joined CORE (Congress of Racial Equality) and worked on voter registration and workplace integration in Louisiana. Arrested for his Civil Rights work. 2nd book of poems: Flower Herding on Mount Monadnock. Translations: The Poems of François Villon (first version). 3rd book of poems: Body Rags. Translations: On the Motion and Immobility of Douve (poems by Yves Bonnefoy). Translations: Lackawanna Elegy (poems by Yvan Goll). 4th book of poems: First poems 1946-1954. 5th book of poems: The Book of Nightmares. 6th book of poems: The Avenue Bearing the Initials of Christ into the New World: Poems 1946-1964. Translations: The Poems of François Villon (second version). Interviews: Walking Down the Stairs (a collection of interviews). 8th book of poems: Selected Poems, which received 1983 Pulitzer Poetry Prize and National Book Award. A children's book: How the Alligator Missed Breakfast. Won Pulitzer Poetry Prize for Selected Poems (1980). 9th book of poems: The Past. Became the state poet of Vermont, in which he was preceded by Robert Frost (who remained the state poet of Vermont for some decades following his death). 10th book of poems: When One Has Lived A Long Time Alone. 11th book of poems: Three Books: Body Rags; Mortal Acts, Mortal Words; The Past. Completed his 4-year term as state poet of Vermont succeeded by Louise Glück. A poem included in the Best American Poetry: 1999. 13th book of poems: A New Selected Poems, National Book Award finalist. Translations: The Essential Rilke (with Hannah Liebmann). One of the first to join Poets Against the War in opposition to the Iraq war of George W. Bush. A poem included in the Best American Poetry: 2003. 14th book of poems: Strong Is Your Hold, National Book Award finalist. The quoted poems are Copyright © 1960-2015 by Galway Kinnell.